not all, it Also has a Composer with Memory for your own Creations. instruments which makes it an exceptional product among its peers. to name. All Taals also come in with a variety of Theks. in the World with its Dynamic Input Power Range of 90V AC to 250V AC. when the power is switched off. up with the Taal’s Tempo & Cycle while Riyaz. Demo Mode: The in built Demo Mode of the Instrument Plays all selected Taals one after the another continuously for 1 avartan each. Volume. The Technical Specification of the same are given below. 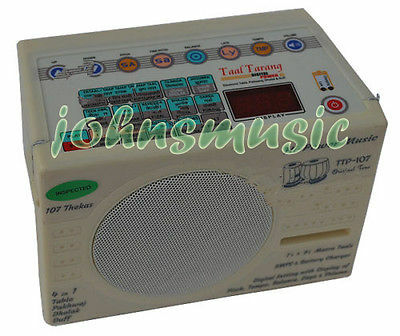 External Speaker Socket: The Electronic Tabla has an External Speaker Socket to Connect it to Bigger External Speakers if Necessary. Battery Operation: The Taal Tarang Digital becomes fully operational with 8 Pencil Cells (AA). In Built Battery Charger: The Taal Tarang Digital Power have one in-built Battery charger to charge the rechargeable cells. from USA/UK has to Buy one Adaptor plug to operate the unit. Taal Tarang: 7 Inches * 4 Inches * 5 Inches. Payment must be done within 7 Working days. Custom Duties or Taxes or VAT not included in the Item Price or Shipping Cost. use/commercial (big order/bulk purchase) for transit formalities. make sure that issue will be resolved as early as possible. do not promote return of the product due to very high cost of shipping.